When the zombies start wandering the streets, nipping out to the supermarket or local takeaway will be tricky. It won't be long before lack of food will become an issue. So it is important to know how much food you need each day. It is fun to take a calculator and start reading all those food labels that you ignore. 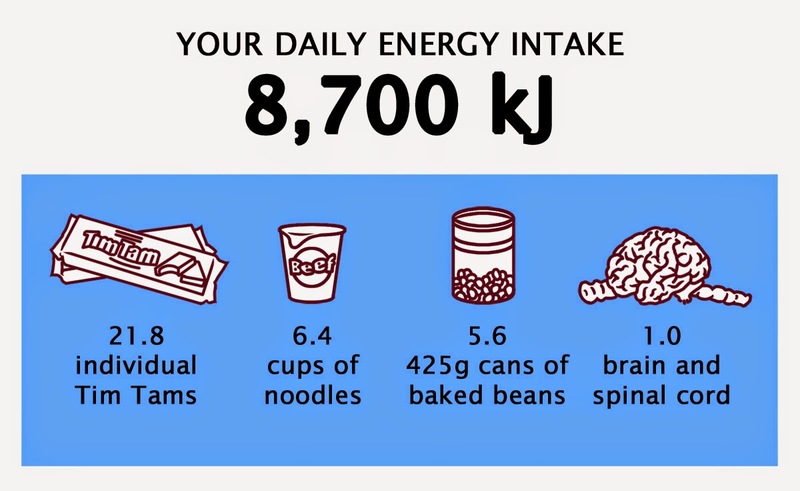 You can work out which foods offer the most energy for the lowest weight. Ultralight backpackers aim to pack food that offers 1850 kJ per 100 grams (125 cal per ounce). Turns out freeze dried ice cream is excellent for this, providing a whopping 2200 kJ per 100 grams. Peanut butter is even better at 2710 kJ per 100 grams. According to my dodgy calculations a 780 gram jar of peanut butter (crunchy) can last you almost two and a half days! Unless you have a peanut allergy. Bite of more peanut butter than you can chew. Oh I have included a human brain and spine to assist zombies with calculating their average daily energy intake. And for anyone contemplating cannibalism.